Superfiend introduces us, or at least those readers not familiar with the comics, to the “Dark Judges,” a group made up of Judge Death, who you see in this clip, Judge Mortis, Judge Fear, and Judge Fire. The group also features the Sisters of Death, Phobia and Nausea, though they were added later and I’m not sure if they’ll appear here. They’re lawmen from a parallel dimension, and when Death decrees that all human is a crime, things are going to get dark and twisted and all kinds of crazy. This isn’t the first time Shankar has made an unofficial follow up to a comic book movie. He’s also the one behind that pseudo-Punisher short, Dirty Laundry, from a few years ago. But this is just a quick taste of Superfiend, a teaser for the teaser, if you will. A full teaser, whatever the hell that means (isn’t that just an actual trailer? ), is scheduled to show up on Thursday, so we’ll be keeping an eye out for that. We also now know that Dredd: Superfiend will drop on October 27, so we have that to look forward to just before Halloween. Take a deep breath… and shave your neck beard anon whiner. 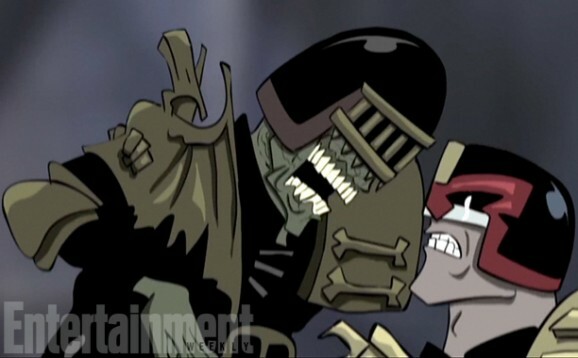 Was there any reason why the producer of the Dredd movie, opted to take on the comic version? Gendy Tartatovsky would have been great for a Dredd animated series.